Halloween is almost here! This is the time everyone starts to run around frantically trying to come up with Halloween costumes. We have some ideas to help make your Halloween a little bit easier. 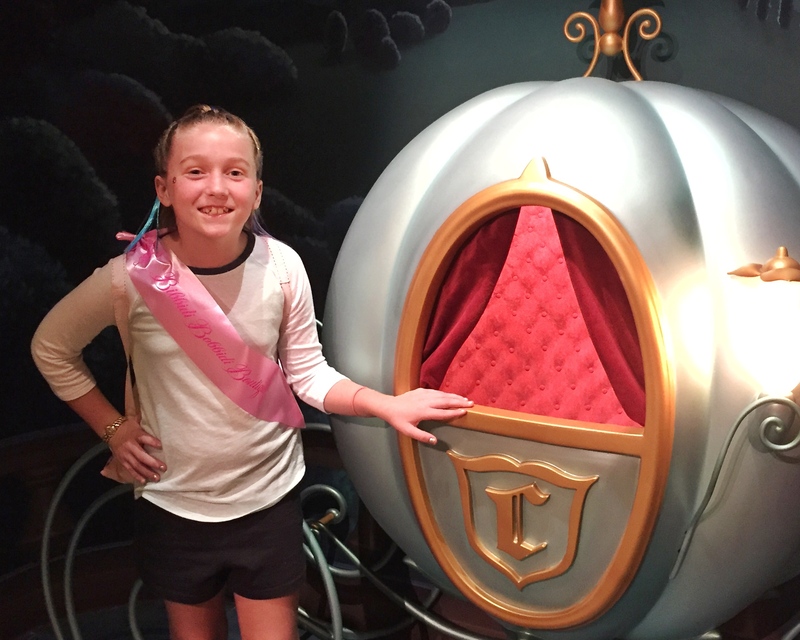 Hunter shares her favorite last minute Halloween costume ideas. You can find cute onesie PJ’s at Target. Hunter picked up a super cute onesie, Sulley from Monsters, Inc. She loves it so much, she wore it as a costume to a Halloween Party. They are more comfortable than your typical costumes, since they are intended as PJ’s. Plus, talk about a super easy costume. I am sure your kids love Minecraft, too! The character Steve from Minecraft is a pretty simple character. You can pick up a blue t-shirt and black pants. You can then paint a box to look like Steve’s head or even purchase a ready built mask from Amazon with prime shipping. One of Hunter’s favorite costumes is a cowboy. Talk about an easy costume! 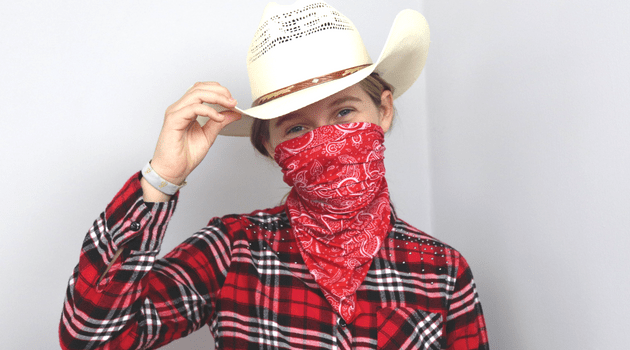 Grab a plaid shirt, jeans, bandana, and cowboy hat. We had all of these items at our house, so we did not have to purchase anything new. Those are always the best costumes! The unicorn costume was one of my favorites. Hunter picked up a unicorn sweatshirt and rainbow leggings at Target. This is a great costume that she can wear more than just one day on Halloween. I love the hoodie with the unicorn head and then the tail on the back of the jacket. Super cute! As you know, Hunter loves Stitch. 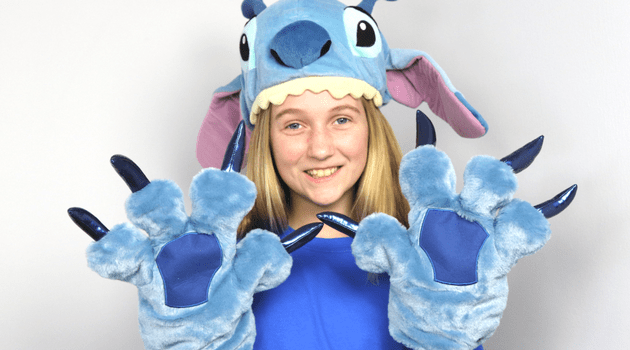 She already had the Stitch hat and hands. She just added a blue t-shirt from JoAnne’s for $2.50 and some leggings. A ready made costume, perfect for Halloween! This is a fun costume for muggles on Halloween. 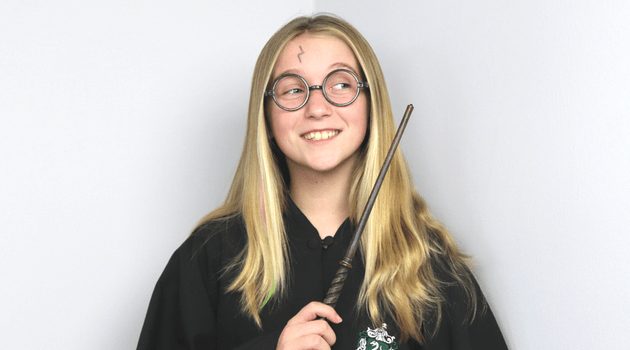 You can dress up like Harry Potter or your favorite wizard. We used an eye pencil to make the lightning bolt, bought Harry Potter glasses from Party City for under $1, and then added the HP cloak. You can also make your own no-sew cloak for under $15. BANANAS! 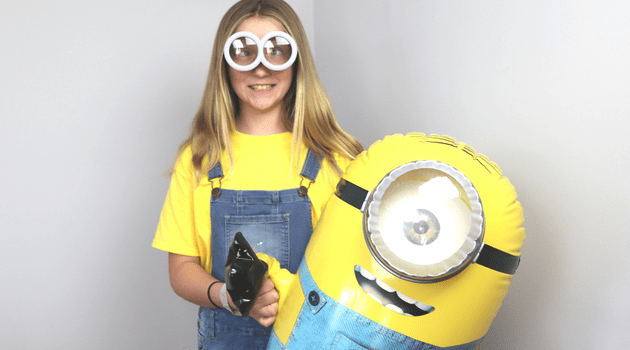 You will not go bananas with this easy costume. You can pick up a yellow t-shirt from JoAnne’s for $2.50 and then add overalls. We purchased Hunter’s overalls at Justice, but we have also seen them at Target. This is another costume, she will wear more than just for Halloween. MOOO! This cow costume was just a white t-shirt, black pants, and a little imagination. We took some black felt and cut it into spots. We then use the hot glue gun and glued the spots to the white t-shirt. We then added a black nose and Hunter transformed into a cow. This was a fun idea and simple! We used a bath robe and printed out some cat pics. We just glued the cat pics to the robe. Throw on some rollers and eye glasses to make the ultimate crazy cat lady. The pineapple costume was one of Hunter’s favs. We took a yellow t-shirt and added black half diamonds using a Sharpie pen. 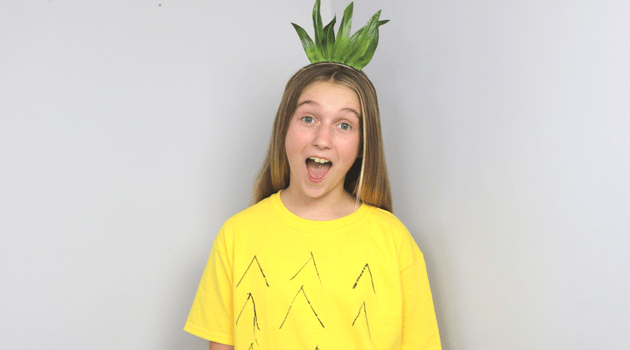 We then took a headband and hot glued some grass to look like the top of a pineapple. Add some black pants and we have a pineapple. What is your favorite last minute Halloween costume?